Though I haven’t mentioned it, this past summer my wife purchased a “retreat” in central Pennsylvania. So, when I’m not otherwise overwhelmed keeping up with everything else going on, I’m enjoying the advantages of being in TWO fine valleys… the Shenandoah, in Virginia, and the Cumberland, in Pennsylvania. Whether by accident or not, the exact location of that Pennsylvania “retreat” is somewhat between a geographic “dividing line” that exists between my ancestors who were in that area… my 18th/early 19th century Pa. ancestors (mostly to the west… but only a few miles), and my late 19th century Pa. (albeit Maryland-born) ancestors (mostly to the north and south, by about half an hour to an hour). So, over the past couple of months, once in a while, I’ve had the chance to take in a little area history… some of which has a little to do with my ancestry there (as seen in my post about the Ironmaster’s Mansion at Pine Grove, just the other day), and some which does not. Here and there, I’ll be writing a little about my people in Pennsylvania, but for today, I’m taking in a little of the non-familial history of the area. 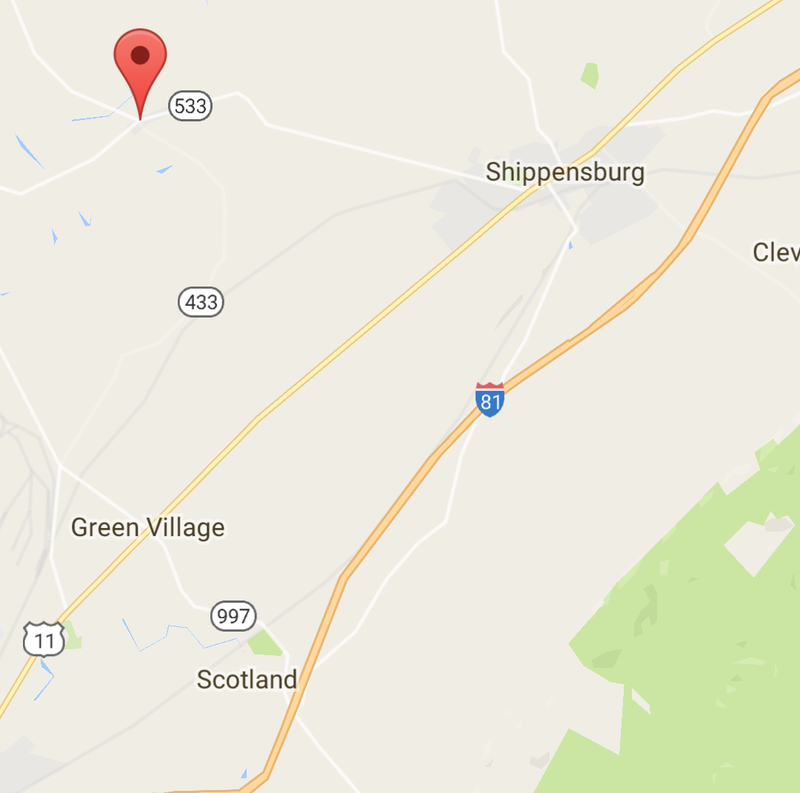 Orrstown is indicated to the west of Shippensburg. 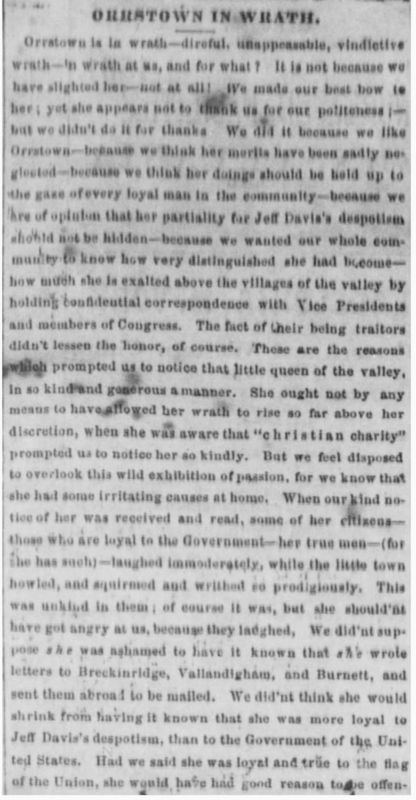 … that the beautiful village will so far forget her “Christian charity” as to visit us with vengeance; if she does, we will begin to think it is a bah humbug; and the truth is we have a suspicion that such is the case, and what is strange, every honest, loyal, patriotic man – every man who is willing to stand by his country in the hour of her greatest extremity, thinks as we do and posterity will be told the tale of its shame and disgrace. Is that sufficient? 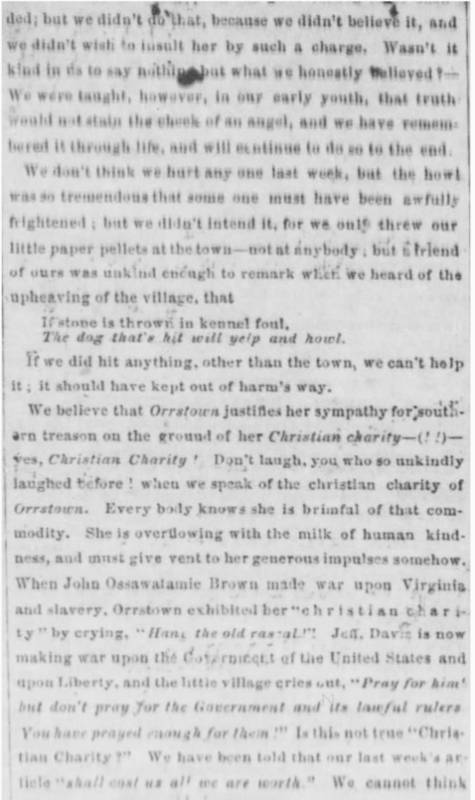 Regretfully, there are no other articles about this person (or people) of Orrstown, but who knows what might come up at another time.